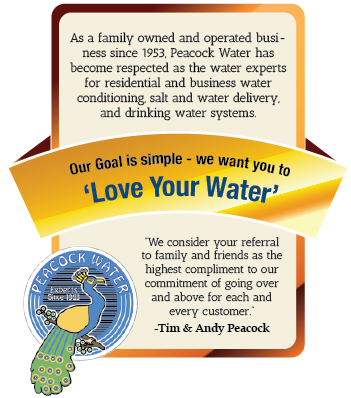 At Peacock Water our mission is simple: We want you to LOVE your water! So whether you need bottled water, a water softener, or a drinking water system, we can help. We service ALL makes and models of water equipment throughout a 20 county area with the help of 25 radio dispatched trucks. If you need bottled water or salt, we offer affordable route delivery service.